1. Descriptive of how something is inexpensively obtained at a bargain price: When Sue went shopping, she was determined to shop only for items she could get a bon marche because of her limited budget. 2. 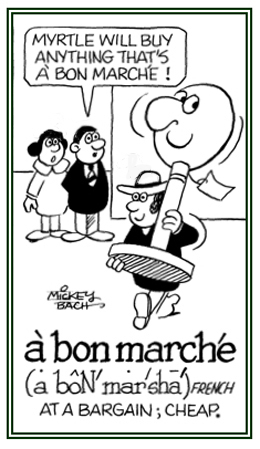 Etymology: from French "cheap, inexpensive." © ALL rights are reserved. An individual engaging in an activity for pleasure or practice, not as a professional: John Peters was an amateur who enjoyed gardening as a hobby. Characterizing someone who performs an activity as a recreation or hobby, not as a trained person: Alison Smith was an amateur actor who enjoyed playing in the local community theater. 1. A specialized vocabulary or set of idioms used by a particular group: The two organizations were still able to communicate with each other in their separate argots. 2. The language of a particular group which is associated with similar activities; for example, the language of street gangs or criminals: Before the fight started, the mobs were yelling out their peculiar argots, or special slang terms, to communicate with their fellow mob members as a kind of code. The teenagers were confusing their teachers by using special argots in their written reports. 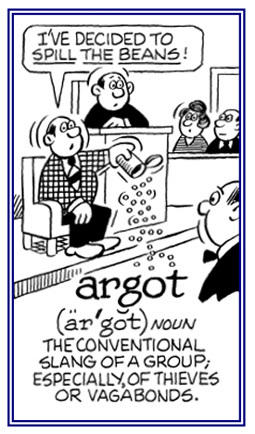 The British have their argots and Americans usually have completely different argots which often result in a lack of understanding of the argots of the two cultures. Sometimes it can be very difficult to understand the various argots of scientists, lawyers, and even medical professionals. 3. Etymology: about 1860, from French argot, "the jargon of Paris rogues and thieves"; earlier "the company of beggars"; from Middle French (the French language as written and spoken about 1400 to 1600), "a group of beggars", otherwise, the origin of the term is unknown. © ALL rights are reserved. 1. A tall wardrobe or cabinet that was originally used as a place to store weapons: Ruth and Ed have two armoires that have two doors each and which they use to store their clothes and other items. 2. Etymology: from French armoire, from Old French armarie, "cupboard, bookcase, reliquary (a place where religious relics are stored or displayed; especially, the relics of saints); from Latin armarium, "a closet, a chest, a place for tools". © ALL rights are reserved. Someone who is officially assigned to the staff of a diplomatic mission to serve in a particular capacity, usually in an embassy: Two examples of attachés include cultural attachés and military attachés. © ALL rights are reserved. 1. A heavy and continuous firing of weapons during a battle: The enemy stopped their artillery barrages and machine gun shooting as their platoon approached the bridge. 2. An overwhelming, concentrated outpouring, as of words that come quickly and continuously: The man in the audience unleashed a barrage of criticisms and insults at the politician. The defense attorney subjected the witness to a barrage of questions about what happened during the robbery by the accused man who was on trial. The reporters fired barrages of questions at the mayor who was accused of being involved with a criminal organization. A color on the very light end of the spectrum of brown shades: The beige of her hat exactly matched the same tone of Ms. Smith's skirt, blending well into the light hue of the desert sand. Descriptive of a color that is a very pale brown: The new wallpaper in her apartment was beige, creating a non-distracting background for the brightly coloured pictures which Janice had collected. 1. Someone or something that is particularly disliked or avoided: Rosetta's brother was a bête noir because of his criminal activities. 2. An object of aversion or the dread of one’s existence: Mike considered his job a bete noir because he had to work so hard and received such small wages. 3. Etymology: from French, literally "black beast". © ALL rights are reserved. 1. To put food in boiling water for a few seconds in order to loosen the skin or to scald food briefly, as before freezing it or as a preliminary stage in preparing a dish for eating: Marilyn followed the directions on the package and so she blanched the peaches briefly before peeling them. 2. To suddenly become pale or to turn white: Sam's face blanched at the mention of Shirley's name. Quentin's face blanched in terror when he suddenly heard the big dog barking at him from behind the fence next to the sidewalk. 3. To grow vegetables, especially celery and endive, in unilluminated conditions in order to whiten the stems and to improve their flavor: The farmer renovated the barn in order to have a darkened area necessary to blanch the crops he had growing there. 4. Etymology: from about 1398, which came from Old French blanchir, "to whiten"; from blanc, "white". Originally "to remove the hull of (almonds, etc.) by soaking". The sense of "to turn white" is from about 1768. 1. A reference to someone who is unconcerned or uninterested in something because of frequent exposures or indulgences: As a businessman, Mark flies first class so frequently, that he has a blasé attitude now whenever the subject comes up during a discussion. 2. Relating to a lack of concern; nonchalant: Marian has a blasé feeling about housecleaning because she must to do it so often. Jim was told that there was a possibility that he could lose his job very soon; however, his blasé attitude seemed to indicate that he wouldn't care if it happened. 3. Etymology: from a French word for being satiated or sick with overindulgence. The term, blasé was used frequently in Parisian aristocratic circles during the decade prior to the Revolution of 1789, and for some reason, it was incorporated into English. A small shop or business specializing in unique products or services: The famous author owned a small boutique which was devoted to selling rare books and old maps. Translation: "Such is life, that's life." An expression used to comment about something which can happen in life, cannot be altered, and causes a disappointment: Greg said, “So what! We lost this game this time. Cest la vie! Maybe next time we will win." © ALL rights are reserved. A small eating establishment that typically serves drinks and snacks, cake, or light foods: When traveling, Jane enjoyed sitting at a cafe and watching the pedestrians strolling past. Showing page 1 out of 11 pages of 154 main-word entries or main-word-entry groups.